Thermal baths in Budapest are definitely among the main attractions of the city. However, still today, there is so much confusion and outdated information about these great places. As the high season is approaching, we receive more and more questions about the baths, so we’ve decided to publish the most frequently asked questions with our answers, so that you can find all the information you need about the wonderful Budapest baths. In this article, we cover the following baths: Gellért, Széchenyi, Rudas, Király, Lukács and Veli Bej and we’ve also collected some practical information on each bath. Feel free to use the comment section on the bottom to ask more questions. In general, the ticket price covers your entrance to the bath. However, some baths have different sections and you need to buy separate tickets for these sections. See the practical information on each bath on the bottom for details. 2. Can I get my ticket online? Currently, you can only purchase your ticket online for Széchenyi and Gellért Baths. See the practical information on the bottom to learn about this option. 3. Are the baths mixed? Yes, except for Rudas Bath. Rudas is open only for men on Mondays, Wednesdays, Thursdays and Fridays, while women can visit the bath on Tuesdays. On weekends and during the night time opening hours (Fri & Sat 10pm–4am), Rudas is a mixed bath. 4. If I only have time for one bath during my stay in Budapest, which one should I go to? It depends on what kind of experience you’re looking for, and it also depends on the season. If you are in Budapest during summer time, then you might want to enjoy the outdoor pools, too, so we recommend that you visit Gellért, Széchenyi or Lukács. Rudas also has a small outdoor pool, but the rest of the bath is indoor (just like Király and Veli Bej). If you’re in Budapest during winter time, then you have many options as all baths have indoor pools. Lukács has a very nice sauna complex, called Sauna World, so that’s definitely a great place to relax during the cold months. Veli Bej is also an excellent choice as all of its pools are indoor. At some baths, the outdoor pools are also open during winter time, so you can enjoy the warm water even when the weather is chilly. 5. Is it OK for a young woman to go to the bath alone? Yes, absolutely. The baths in Budapest are safe, and actually, many locals go to the bath alone. 6. Do all baths have outdoor pools, too? 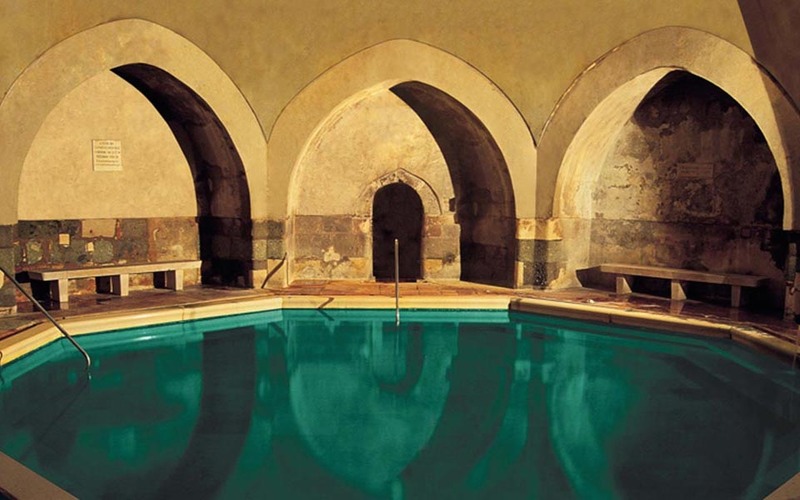 No, some of the baths have only indoor pools, such as Veli Bej and Király. Also, during winter time, not all outdoor pools are in use. 7. Where should I put my locker key while I’m in the pools? At all baths, there is the same system of rubber bracelet that visitors can wear on their wrist while they are in the pools. It is also with these adjustable rubber bracelet (they look like watches) that you can access the different sections of the baths. Note that the rubber bracelet cannot be used for paying at the cafés, you will need cash or card with you for that. 8. What services are offered at the baths? Besides sitting in the pools and enjoying the nice and warm thermal water, you can also explore a number of other services, such as massages, different saunas, jacuzzi, kneipp bath, etc. Check out the practical information on the bottom to see what is available in each bath. 9. Are there restaurants and bars at the baths? There is at least a café in each bath with snacks, but at Rudas, there is also a brand new restaurant. 10. Is there any special etiquette at the baths that I should know about? People go to the baths to relax and to recharge their batteries. Also, some people use the baths for the healing effect of the thermal water. Therefore, make sure you respect others and try not to disturb them with loud talking, jumping around in the pools, etc. 11. Which option should I choose: locker or cabin? Tickets with the locker option are cheaper, however, the price difference is actually not that significant. Cabins are great because you have more privacy while changing, and also, you have more room for your belongings. However not every bath has a cabin option. See the practical information below for more details. 12. Which baths has the most beautiful architecture? It depends on what you’re looking for. Széchenyi has a more classical look with its Neo-Baroque style. Gellért is a beautiful example of Secessionist-style in Budapest. Rudas, Lukács, Veli Bej and Király are Turkish baths, so you’ll find some typical Turkish hammam elements, such as the cupolas. Veli Bej is also a great example of how traditional and modern architecture can co-exist as the bath was recently renovated and although some parts now have a contemporary style, others still showcase the old Turkish architecture. 13. Is it safe to leave my valuable belongings, such as money and my camera, in the lockers? Our experience is that it’s absolutely safe to keep valuable belongings in the lockers or cabins while in the pools, but still, we recommend that you take only the most necessary items with you to the baths. 14. Are the baths open during the night? Rudas bath is open until 4am on Fridays and Saturdays. There are also bath parties on a regular basis at Széchenyi and/or Lukács. This summer, you can party at Széchenyi every Saturday. Click here to learn more about these parties. 15. Which bath is the best for wellness? 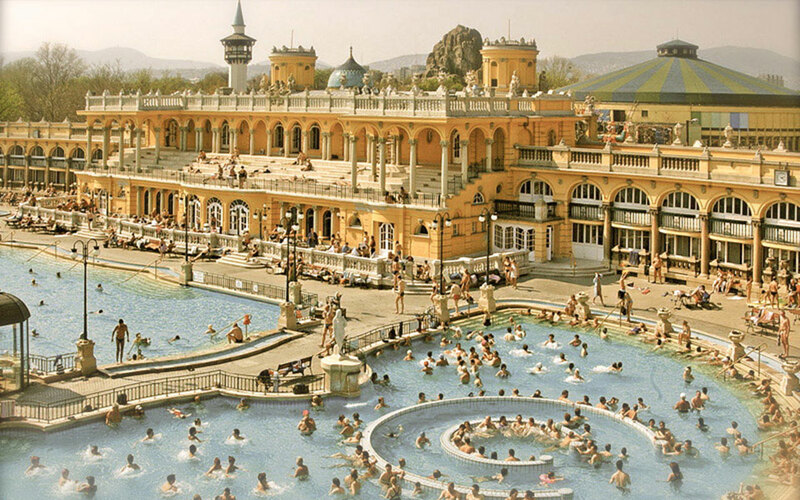 For a great wellness experience, you should visit Gellért, Széchenyi or Lukács baths. Rudas also a has a new wellness section but they offer less services. 16. Is it safe to drink the thermal water? Yes, just look for the drinking wells at the baths. 17. Can I go to the baths if I’m pregnant? If you’re pregnant, please make sure you consult your doctor first before you visit the thermal baths in Budapest. 18. Do I need to wear a bathing cap at the baths? You need to wear a bathing cap only in the swimming pools. If you don’t have a bathing cap, you can rent one at the bath. 19. Do I need to wear flip-flops or a pair of slippers in the bath? Yes you do, but make sure you don’t have them on when you go into the sauna. 20. What is the sauna etiquette like in Hungary? In Hungary, there are mostly mixed saunas, so men and women go to the saunas together. Therefore, we always keep our swim suits on. However, there are some saunas, including the Sauna World at Lukács Bath, where you can’t wear a swim suit but instead, you have to wear a towel around you. Also, please remember to always sit on a towel in the sauna and to leave your flip-flops or slippers outside. 21. Is there a hairdryer I can use or should I bring my own? Yes, there are hairdryers that you can use in the changing rooms. 22. Can children use the thermal baths in Budapest? The thermal baths are not recommended for children under 14 years old. Tickets: Check out the Gellért Bath website for detailed info on the various ticket options. Is there a café or restaurant? There is a café at Gellért and during summer time, there is also a cocktail bar next to the wave pool. Changing room: You can ask for a locker or a cabin. Why we love this bath: The Secessionist-style architecture of Gellért is absolutely stunning. Tickets: Check out the Széchenyi Bath website for detailed info on the various ticket options. Other facilities and services: Széchenyi offers a great range of other services, including saunas, massages, swimming lessons, or a fitness center. Check out the website for more info. Why we love this bath: The outdoor pools at Széchenyi are great on a hot summer day. Also, we love the green setting of Széchenyi as it is located in the City Park. Opening hours: Swimming pool: 6am–10pm daily, Wellness and Sauna World: 8am–10pm, Baths daily, 6am–8pm daily. There are also special night time opening hours: Fri-Sat 10pm–4pm. Please note that the Sauna World is not open during the night time hours. Tickets: Check out the Rudas Bath website for detailed info on the various ticket options. Is this a mixed bath? Rudas can only be visited by women on Tuesday and by men on Monday, Wednesday, Thursday and Friday. Weekends and during the night time opening hours on Friday and Saturday, Rudas is a mixed baths. Number of pools: 6 pools with thermal water, 1 swimming pool, 5 wellness pools, including a rooftop pool. Other facilities and services: Sauna World and Wellness area, massage, including skin firming, medical, deep nourishing massage, underwater jet massage, pedicure (you can make a reservation on the spot). Is there a café or restaurant? There is a small café and also a restaurant at Rudas. You can go to the restaurant even in your swim suit because they provide the guests with bath robes. Why we love this bath: If we have to pick one great thing about Rudas, then it must be the rooftop pool. It’s such a special experience to be sitting in the warm water while enjoying the view over the city. Tickets: Check out the Király Bath website for detailed info on the various ticket options. Number of pools: There are 4 pools with thermal water. Other facilities and services: Finnish sauna, massage, including medical, refreshing massages, foot massages and underwater jet massage (you can make a reservation on the spot). Is there a café or restaurant? Changing room: At Király, you can ask for a locker or a cabin. Why we love this bath: Király is small intimate bath and it’s also less frequented by tourists. 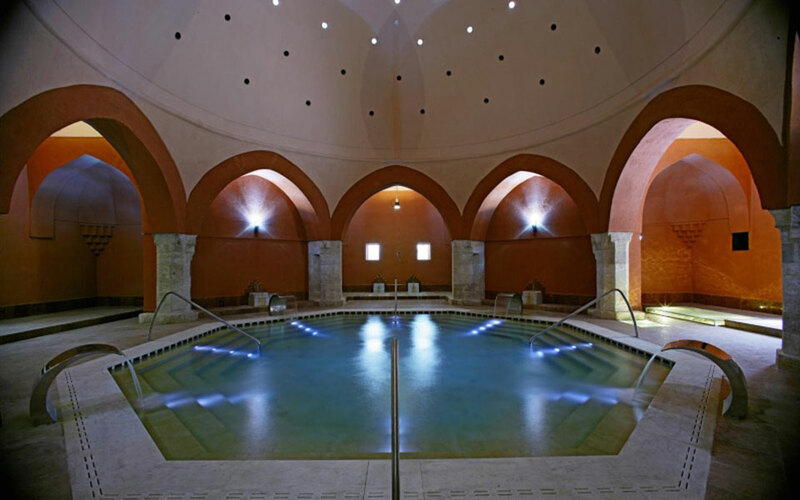 If you’re looking for a relaxing, Turkish bath experience, then you’ll love Király Bath. Tickets: Check out the Lukács Bath website for detailed info on the various ticket options. Free entry with Budapest card. Number of pools: 4 thermal water pools, 2 outdoor swimming pools, 1 outdoor adventure pool. Today, the two outdoor swimming pools are still called female and male pools, which refers to the time when men and women used the bath separately. Other facilities and services: Sauna World with Finnish, infra, steam, naturist and salt saunas, Himalaya salt wall, igloo, tepidarium, heated roman seats, mud treatment, massage, including aroma, refreshing, medical and under water jet massage (you can make a reservation on the spot), Lukács also offers the option of private bathing for couples. Is there a café or restaurant? Yes, there are several cafés at Lukács. Changing room: At Lukács, you can ask for a locker or a cabin. Why we love this bath: We definitely recommend trying the Sauna World at Lukács. It’s one of the best relaxing experiences. Changing room: at Veli Bej, there is no separate changing room for men and women and instead, they have a rather interesting system. When you buy your ticket, you’ll be given a locker number and the usual rubber bracelet (see the information above on that). Then you’ll enter the changing area where you’ll have to find your locker. Once you’ve found it, you should go to one of the cabins in the middle of the changing room to change. The cabins are accessible from both sides and you can lock them by pushing down the bench (don’t worry, you’ll figure this out once you’re there). When you’re done, you can go back to your locker and put your stuff in there. Then, you’ll have to go through the shower areas to get to the bath itself. There are, of course, separate showers for men and women, just make sure you check the signs. Why we love this bath: Veli bej was recently renovated, so it’s in excellent condition. It’s also less crowded as this bath is not part of the Budapest baths network. The number of visitors is limited (maximum 80 people), so if the bath is full, you’ll be put on a waiting list. Try to go to Veli Bej during daytime, the lights coming through the windows on the cupola make the atmosphere truly special. Read our article about Veli Bej with more details (including directions) and pictures. Hello it’s actually a cool and helpful piece oof info.